Digital and offset printing require more or less the same techniques to print electronic documents. However, since the printing processes are different, as well as the prepress infographic (imposition technique, file processing, color management, …), it is necessary to take a closer look at certain aspects of the printed document, in order to to validate the consistency of the work rendered by the printer. Contrary to popular belief, it is not so easy to print a document and some technical features may sometimes be missing from the printers. This is why this list may help you to validate the reliability and consistency your printed project. The PDF format is a universal file format developed by Adobe to maintain the layout of a document, regardless of the application and platform of origin and that is why printers prefer type of file. Nevertheless, the printed PDF differ from what appears on the screen. This is particularly the case for fonts that are partially included. In digital printing or imposition, another type of font can replace it, making the printed product inconsistent with the original (e.g. symbols that replace accents, adding pages, different font style, …). All presses may get misaligned during production or may not have been calibrated properly prior to production. You need to check the quality of the color with a CMYK color chart or check the output against the printed proof submitted to the printer. The colors may vary even between two digital presses of the same model, so to ensure accuracy, it is better to request a print on a single digital press. It’s difficult to obtain a consistent color over a large printed area, whether in offset or digital. To increase the chance of color consistency, it is best to request in advance, that these sheets are placed in the centre of the imposition, in the offset printer. On the digital side, check that the printer meets the standard of the “corona wire / corotron” before printing. To verify a CMYK-printed PMS color, it must be compared to a PMS color chart with CMYK equivalence. The digital press will print PMS color in CMYK, according to a color chart established by the manufacturer. However, some digital press servers may have a manually adjustable PMS table that overrides the manufacturer’s default table. This occasional manual intervention, if still present in the server, could compete with the color you wish to use. It is better to design a document that is without PMS colors to avoid any possible interference. PMS color transparency effects are very often misinterpreted by printer servers. To resolve the issue, you have to convert the PMS color into CMYK before sending the document to the printer. What’s more, in Illustrator, when saving the problem file, an alert message will pop up to warn you. 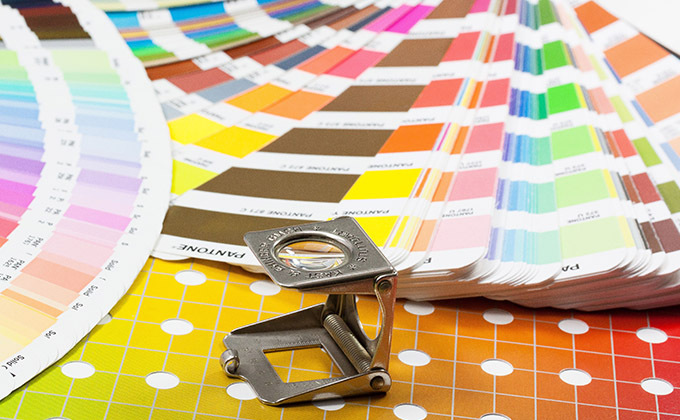 Digital printing can face as many difficulties as offset printing when superimposing colors. This phenomenon occurs when the lasers are misaligned causes one or more CMYK colors to shift, ever so slightly. For example, one or more colors interfering around a text that should normally be white. Conversely, for a text composed in CMYK, one or more colors could spill over the form. The fiber of the paper pulp refers to where the resistance of the paper is reduced. Thus, for an optimal quality of a printed sheet, the direction of the paper grain or of the cardboard used for printing must be taken into consideration by the printer in order to have optimal folding, but also to avoid having pages that are fold too easily or are difficult to fold. A fold made in the opposite direction to the grain is more inconsistent i.e. the fold will tear the edge of the sheet, thus breaking the ink and revealing the white of the paper. To check the register between 2 sides (front / back) you must have one or more dots printed on both sides and view the printed sheet transparently. Your reference points must be in the same position. In digital printing there may be a misalignment caused by the margins of the printer. However, this small inconvenience is easily avoided by shifting the odd pages from the even pages via the print server or via an imposition program. Whereas in offset printing, the register error would be found at the imposition level and this error is costly for the printer as the press plates have to be remade. In offset printing, most printers now have servers that handle color overlap to overcome the problem of white space between colors caused by mechanical distortion and / or moisture in the paper. It is highly recommend that you check if your printer system has those functions. However, it is possible to “manually” manage the overlapping colors using Illustrator, InDesign and QuarkXpress. To do this, when the printer sends an electronic proof, verify that the desired overlap is respected via Acrobat Pro. In an imposition with missing links, the file is printed in low resolution instead of high resolution. Due to the lack of moisture in the environment of digital presses, there may be black spots on the printed color and around those, a white halo. The humidity level around the printer should be raised. The fusing element (Fuser assembly) of digital printers, used to heat the ink so that it adheres to the sheet, wears away over time with the passage of large number of x sheets (smaller size) leaving a mark on the y number of papers (larger size) printed next. When this mark appears, the fusing element must be replaced by the operator or the maintenance department. In conclusion, it is important to know that your best safeguard is to have the printer a calibrated and a consistent press proof before the complete production of your document. It’ll save you energy, time and money.